Fall already? 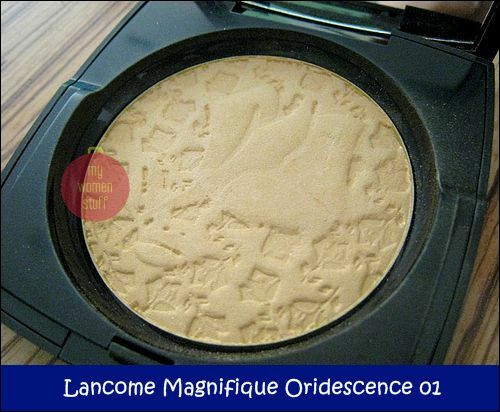 Well, not yet but I had to show you what Lancome has in store for Fall 2009 with the Declaring Indigo Collection. I loved how it looked in the pictures I’d seen so I was super thrilled to play with the preview products and pick up some product swatches. This is the second collection by Lancome’s designer Aaron de Mey which make me think – rock chic. Its certainly colours much stronger than I’d ever seen in previous Lancome collections – and I like it! The star for me is the Indigo Royauté eyeshadow palette – 2 Indigo blues (one flecked with gold and another satin in texture), one bronze and one gold. I can just imagine how it’d look on the eyes especially if you can pull of strong eye colours or blues on the eyes. I actually saw this on someone recently and its pretty amazing! 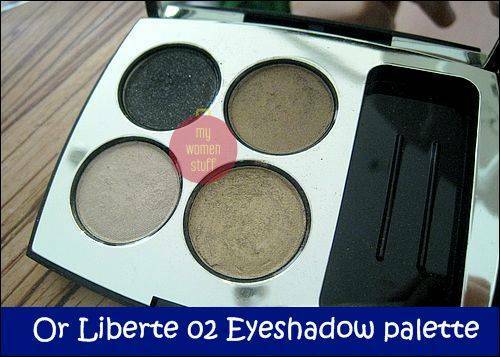 The other eyeshadow palette is Or Liberte palette which has 1 sparkly black shadow, 1 bronze, 1 neutral and 1 gold. This one didn’t excite me much mainly because I’m more into colour. More pictures below – picture heavy! 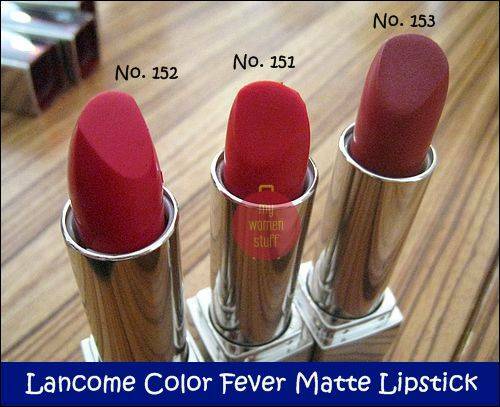 There are also 3 new Color Fever lipsticks in matte red. Indigo on the eyes and Red on the lips – certainly a very bold look to sport! The 3 Color Fever lipsticks are in Nos. 151 (Red Avant Garde – bright warm red), 152 (Red Paris Paris – cool-toned red) and 153 (Red Libertine – mauve-red). They swatch matte but can be plumped up with the new Color Fever glosses in gold and red. As the preview products were new and as I was encouraged to test it, I decided to try Color Fever lipstick No. 151 on for size. Apologies for the smeary look. It swatches so bright Kahani swore that all she could see of me were my lips from a mile and a half away! LOL… Its pretty but may not be quite what I’d go for for something subtle. No. 152 is more toned down and may be a better shade for me. There is a gold bronzer/highlighter which is pretty for highlighting I can imagine. There is silver overspray on the Lancome rose I believe when its new but the preview product I saw was already rubbed off. There are also Kohl pencils in Indigo blue and Gold – the signature colours of the Declaring Indigo collection which is repeated in the Le Vernis nail polishes. There is also an Artliner gel eyeliner in Carbon – a nice matte black. I believe gel liners are a first in Lancome. I liked looking at the Indigo and gold colours together on my nails. It made me think of Egypt for some reason. The Aaron de Mey technique of a “french manicure” for the Declaring Indigo collection is quite unique. First, the gold layer is applied on the nails, then the Indigo Paris colour is layered on top, leaving a “french tip” at the base of the nail instead of at the top. It was certainly intriguing and very Egyptian to me! The Lancome Declaring Indigo collection for Fall 2009 is available at Lancome counters in August 2009. Unusually for me, I’m taken by the Le Vernis nail polishes and maybe the Color Fever lipsticks in No. 151 and 152. The Indigo Rayoute eyeshadow palette too looks interesting… if I can figure out how to place the colours well. Now I’ve seen someone wearing it, I’m even more keen than ever! 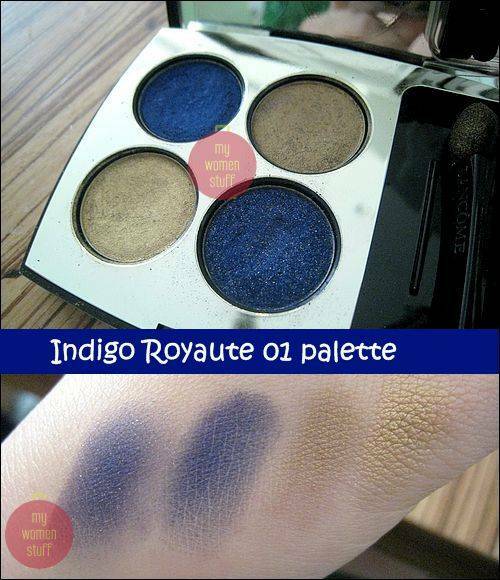 I really like the Indigo Royauté eyeshadow palette, can imagine my eyes screaming for attention if I wear this. Definately will check the palette out when its out in August. For the Indigo eye palette… is the color really as pigmented as it looks in the picture as in a nice dark blue indigo? ps: #151 is kinda scary!! Hey Paris! Ok, I’m gonna go off topic here, but I hope you didn’t throw out your Guerlain Eye Kohl [loose powder]. I saw this video on youtube, and this lady showed another way of applying the liner. She “divides” her eyes in half, then she presses the applicator on the inner lower water line, closes her eyes and opens it. Then, she does the same thing on the outer lower lash line. She didn’t pull the applicator at all! And she got very very little fallout that way. The tight lining part is towards the end. Should check out her eyelash growth products too. Thanks for the heads up! I’ll give it another shot. how come you get to play at the preview!? jealous! i love lancome quads and blues but for some reason, these two don’t look very exciting. and the swatches you did don’t look very pigmented. are they as pigmented as the previous ones? i like that 310 blue a lot as it is pigmented and good mixture of colours. if you check http://www.theshadesofu.com/2009/06/straight-from-paris-lancomes-declaring.html, i think it’s the same stuff…. It feels a little different to the #311 blue quad that I have. It looks pretty on the eyes but less so on the back of the hand but I must admit – 2 golds + 2 blues in one palette is a strange idea! Its the same stuff launching worldwide.